When I built this house in 1987 and was so very proud to have solid oak kitchen cabinets. Boy, did I learn to hate them! Not that there is anything really wrong with oak, it is a nice wood with lots of grain and it was very popular in the 80s. So, not being brave enough to take on painting oak myself, I hired a professional. Cabinets were painted BM Navajo White then slightly distressed and glazed with min-wax provincial stain mixed with a glazing medium. We updated all the hardware to oil rubbed bronze and replaced the old green laminate counter tops to granite. Anyways, this is my new microwave hood – we love the dimension it adds to the cabinets! I think the coloring in some of these pictures is off because the cabinets are more creamy white than yellow. Do you see the feet underneath the cabinets? We think they add some character. Also you will notice the old scalloped thingy over the windows has been replaced with this straight one. We had this cabinet built and used the granite remnant from where they cut out our sink. (By the way those two pics hanging to the right of the cabinet – I painted those myself!) 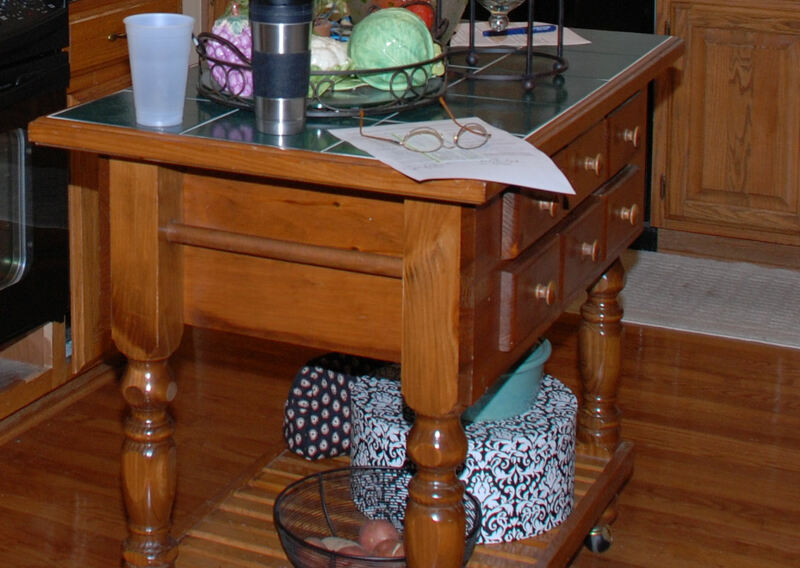 I love the little feet on this cabinet – see close up below. That’s our pantry to the left of the dining room door. We wanted it to look more like furniture so we had a furniture type molding added to the bottom. This is a close up of the pantry molding. The side of our pantry and some of the cabinets were very plain so our cabinet maker/painter guy added these bead board end caps. He also added a bead board back splash for us. I took this pic from the sink area so you can see our breakfast nook. By the way we painted the kitchen BM Decatur Buff – a color I will most definitely use again. I also updated the rug to one with more of my most favorite color red. By the way, this is the original island – can you believe it? We added a new spalted maple top, corbels, new drawer pulls and the cabinet painter guy painted it black with copper glazing. I could have kissed him!!! Take another look at the before below. I really didn’t think the “before” island was so ugly until it was updated and I looked back at this pic! I love that the top is longer now so I can pull up a bar stool (if I ever get one!). We also had this little drop down door added beneath the stove. When we replaced the stove several years ago it left a space at the bottom. Now I can use it to store trays! Yippee – more storage space! So, once again here is the before and after shots. I love to wake up in the morning and stroll into the kitchen for a cup of joe! We still have some work to do – I would love to add recessed lighting and replace that ugly fluorescent fixture with a hanging one. Now a question for you – would you add a window treatments??? I sometimes think with all the hard surfaces a little soft fabric might make it more homey. My husband disagrees. What do you think? I really appreciate your feedback! >White is ALWAYS better for cabinets. It looks great. >I too would be interested to learn about your prep work and the exact color of stain/glaze that was used. This is exacly what I have been looking for in my own kitchen- something bright and airy, yet not stark white. My email is tripler81@hotmail.com. Thank you! >Did they have to take the cabinets down or did they paint them in place? Looks great! Would you consider it an expensive job? >Gorgeous kitchen!! I just love it!! Could you please send me an email as well is regards to prep and materials used?? pdavid773@gmail.com is my address! Thanks!! >Wow…you guys did such a great job..I am in Love!! I absolutely love everything about your kitchen..the colors of the cabinets, the glaze, the granite, all the details, the hood over the microwave, the beadboard, the hardware…EVERYTHING. I love the touch of country! I was wondering if I could get the color of paint you used as well as the glaze. Did you get most things from Home Depot or Lowes? What brand of paint did you use? What process/order did you do your kitchen in? Did you paint them yourselves or hire someone to do it? My husband and I just purchased a short sale and while the cabinets are not terrible, I either want them darker or white and from what I have found out it is easier to go white. I really want to do wood floors in our home and can't stomach doing wood floors the color of the current cabinets and therefore would love as much information about your transformation that you have…I just love it! Did you purchase the feet on your cabinets at Home Depot? Did you do your bathroom cabinets as well? Are you located in the Northern California area by chance? Well sorry to bombard you with soo many questions, but I love the work you have done and would love to duplicate many of the features. If I can get any info I would greatly appreciate it and will email you pics of our finished product. You can email me at smarblern@gmail.com Thanks and great work!! 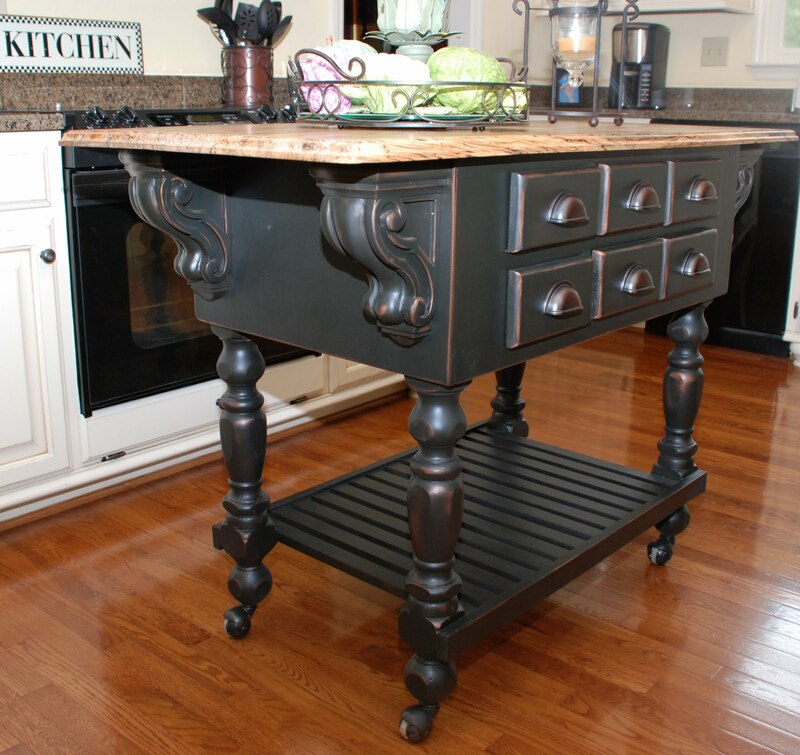 Hi – looks great, how did you get the cabinets to look distressed? I LOVE the transformation and all of the details that you paid attention to!! I’ve talked with 3 painters and they all said I would see the texture of the oak grain through the paint. One even said the glazing would make the texture even more pronounced. I don’t see the grain at all in yours, though. Do you know what process/products your painter used? Do you have his contact info.? My email is tomandcarey@hotmail.com Also, did you lose storage about your microwave when you put in the darling hood or are those beadboard doors above it? LOVE it!! Hello! Your kitchen looks beyond fabulous. Did you use a grain filler??? Is your wood grain still noticeable now that you’ve painted? My husband and I just bought a house and are planning to paint the cabinets just like yours. Enjoy your beautiful kitchen!!! We have oak cabinets exactly like yours and want to paint them white…just like yours. Could you please email me with exactly what you had to do to them to get them ready along with the paint colors, steps they took, etc. I would sure appreciate it! We ate glad that you found us and found the blog post helpful. We hope that you come back for more. Good luck with you kitchen! can you tell me what kind of granite did you use? Slab or Mini Slabs? Name of color? It looks great we are doing white cabinets with our black appliances and I was unsure if I should do all Black Slab or a lighter one, attempting a black and antigue white look with Black nobs. Great pictures…I like very much, thanks. Cassity- It looks like many of us are interested in the same answer in regards to the steps taken to paint these oak cabinets. Especially since there is no grain showing through (which is the look most want to achieve when painting). Can you follow up with a post replying to everyone on how this was done? It seems easier to have one person contact the guest poster to the benefit of all? I would also love to know the color paint and glaze used. It would be great if you could even get the contractor to join in the conversation. GREAT PICs of a fabulous kitchen redo. Would appreciate more information. I have the same orange/oak cabinets and want to change them. I had home depot come out yesterday to discuss options. Was considering refacing…but this morning thought to look up painted cabinets and yea I found you. I now will find someone to paint mine white!! Thank you for your post. Your kitchen looks really pretty.